Of all of the electric lamps and lights that are in my collection, two pair and a single one are especially dear to my heart. One was given to me as a child-a lamp that also had a doll with it. It was a 70s thing, and it was given to me by my Auntie DD. Grandma O’Donnell gave me a pair of urn-shaped lamps with flowers on them (one was broken so I can’t recall if I kept it to repair it, or if it was discarded), and last year my Auntie Betty Jo, Auntie DD’s younger sister, gave me a pair of lamps she knew I long admired. Auntie Betty Jo and I have a special bond. You see, we both like the same style furnishings, love bric-a-brac, and inherited the “clean gene”. Great Grandma Anna Pogreba Mayer was well known for her cleanliness, and both Auntie Betty Jo and I have carried on that trait. We don’t mind cleaning our homes and all three of us take a great deal of pride in our homes and its presentation. While I got the lamps, I didn’t get any shades to go with them. Knowing Auntie, she probably thought they were “filthy” and tossed them. Last month, I was walking through Walmart and found the perfect shades! I decided to put Auntie Betty Jo’s lamps in the Dining Room, inspired by Downton Abbey and its placement of lamps that go with the dining room scheme. The colors in the lamps are found in the Dining Room’s wool carpet and compliment the wallpaper border perfectly. Thank you, Auntie Betty Jo! 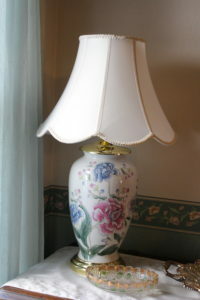 One of Auntie Betty Jo’s lamps in the Cottage’s Dining Room, on the Pepin Sideboard.